For the full benefit of moxibustion without smoke or strong odour. A 1:5 in 25% alcohol tincture extracted from a formulation advanced by Henry Nield, DipOM, BAcC, MRCHM, of England. The formula consists of five herbs: Folium Artemisiae (Ai Ye, the key ingredient of moxa), Cortex Cinnamomi (Rou Gui), Cortex Eucommiae (Du Zhong), Radix Achyranthis (Niu Xi), and Radix Ligustici (Chuan Xiong). 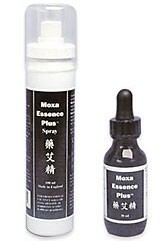 Moxa Essence Plus(TM) is applied either by spraying or by drops. Warm the area with a theraqeutic heat source, such as the far infrared therapeutic device FIRARD-3(TM), a regular heat lamp, or even a hair dryer. A great substitute for either the dry moxa rolls or the stick-on moxa cones. Either two sprays or two drops contain constituents equivalent to one typical stick-on moxa cone. The Moxa Essence Plus(TM) does more than just substitute regular moxa. The formula is also designed for invigorating constitutional defieiency, particularly when it is applied on the back around the meridian points BL23 and BL25. Recommended therapy is to apply two-to-three drops on the targeted area and then treat the area with a theraqeutic heating source for approximately 20 minutes. Repeat the application Moxa Essence Plus(TM) two to three times during the course of a treatment.